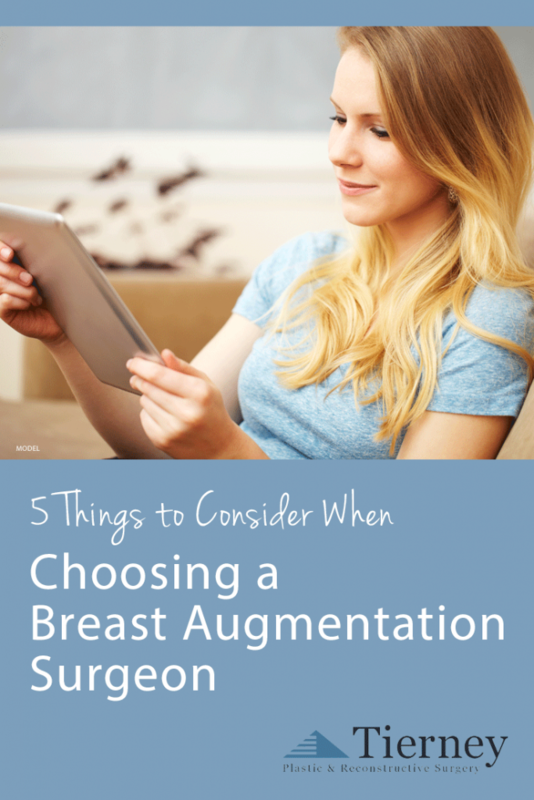 If you’ve recently made the decision to get breast augmentation, congratulations! My Nashville patients tell me that this choice is a very exciting step, but that it also can be a little overwhelming. Let me put your mind at ease with some tips for the next part of your journey: choosing a surgeon. 1. Credentials: First and foremost, any surgeons you consult with for breast augmentation or any procedure should have a medical degree from an accredited graduate university. They should also be certified by the state medical board where they practice. In addition, your surgeon should be certified by The American Board of Plastic Surgery. This group holds high standards of ethics and practical safety and requires members to undergo an extensive process for certification and recertification as years go by, indicating the surgeon’s continuing education and training in the study of plastic surgery. Additional memberships in prestigious organizations, such as the American Society of Plastic Surgeons® or American Society for Aesthetic Plastic Surgery, are also a good sign. You can usually find a surgeon’s certifications by visiting the About page on his or her website or by simply asking at a consultation. You may also use The American Board of Plastic Surgery’s search tool to research a specific doctor or find board-certified plastic surgeons in your area. 2. Experience: Experience in breast augmentation surgery in particular is another important factor to consider. Ask the surgeons you consult with how many breast augmentations they have performed, as well as how many in the past year. Once you have an exam, ask how many cases similar to yours the surgeon has seen. Ask about the specific techniques the surgeon prefers to use in such cases, and then check that information against what you hear from other surgeons and what you read online. 3. Photo gallery: This is another way to see for yourself how much experience a surgeon has with breast enhancement. A surgeon’s before-and-after photo gallery will tell you about the type of patients he or she normally treats and give you an idea of your potential results. Look through each case and examine results on women with similar body types as yours. A surgeon should have a wide variety of cases with strong results. Many surgeons have photos on their websites, as well as many more at the practice. 4. Bedside manner: Breast augmentation surgery is a personal and sometimes emotional process, so your surgeon should make you feel completely at ease. You should feel comfortable enough to discuss all of your questions and concerns before, during, and after your surgery. Building a strong foundation of trust and comfort will help reassure you that you’ve made the right decision. You can get an idea of a surgeon’s rapport beforehand based on patient testimonials. Some surgeons will have these included on their websites, while others can be found on public forums like RealSelf, where people can openly discuss their experiences with their surgeons and the procedures they received. Then, once you meet the surgeon in person, ask yourself how you felt about it. Did you feel welcome, comfortable, and at ease? 5. Options available: As a patient, you have a number of options to choose from for your breast augmentation. This includes the shape and type of implant, the incision location, and more. Your surgeon should discuss these choices with you and help you determine the best ones based on your body structure, lifestyle, and desired results. Be sure this discussion is open and that your surgeon asks you enough questions to understand your needs. If you’re considering a breast augmentation in the Nashville area where I practice, I invite you to explore my website and learn about my plastic surgery training and experience performing breast augmentation. Request a consultation if you’re ready to discuss your candidacy and the procedure in person.